For the beginning trapper, trapping mink on a consistent basis can seem like an impossible task. However, even though they're not as easy to trap as muskrats or raccoons, you'll find mink in many of the same areas, making this the perfect time to create a few mink sets too! Mink are small, illusive furbearers that usually don't leave a lot of obvious sign, which is one of the reasons they're so hard to trap. Learning how to spot and identify mink tracks on a muddy riverbank or in the snow is probably the easiest way to know you're in the right spot for a mink set. Look for small, round, fuzzy tracks with distinct claw marks....a telltale sign of a mink. Understanding their habitat can also increase your odds of catching one in your set. Mink love to squirm and snake their way through roots, brush, tall grass and holes as they search for food along the banks of streams and rivers. Although they're primarily a land animal, mink spend a lot of time along water sources looking for frogs, crayfish, minnows, mice and a variety of other things that make an easy meal. To increase your odds at trapping a mink on a consistent basis, let's look at some basic traps, sets and bait options that are proven to be successful. There are a variety of mink traps you can use to successfully trap a mink. Two of my favorite traps are the #1.5 coil spring and the 110 conibear. I like to use these traps because they're small, versatile, easy to set and easy to carry. For example, it's not uncommon to find signs of mink present as you're setting traps for a muskrat. Since the #1.5 coil spring and 110 conibear traps work great for muskrats, you can quickly make a mink set too without needing to carry special traps just for mink. Since mink are not picky eaters, the best mink trap bait is really just a matter of preference or opinion. Fresh fish seems to perform well in the early season and once things freeze up a little, muskrat works great. 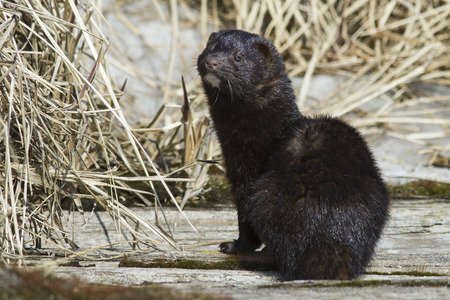 For more information on baits, lures and sets, read these articles titled mink trapping techniques and mink trapping tips for some great information that's sure to increase the amount of mink you trap this year. Another very popular and productive way to trap mink is by building a homemade box that holds a conibear trap. The box acts like and resembles a cubby or den, which mink naturally have the desire to investigate. Place some bait and lure at the back of the box behind the trap, and you've just created a great portable and productive set. If you're interested in building your own mink box you can view step-by-step instructions of our mink box plans here. If you're looking for a way to remove mink without using a kill trap, here are a few options for humane mink traps that will allow you to trap a mink using a non lethal trap. 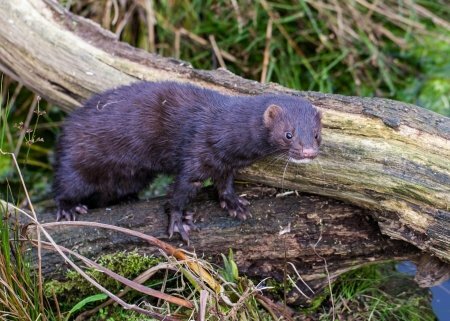 If you want to know how to trap mink successfully you need to understand a few mink facts first, that way you know how the animal behaves, what they like to eat, and more importantly where do they live and how to they travel. Mink habitat generally consists of the edges of rivers, streams, lakes and marshes. Twisted brush piles, tall grass and other similar types of terrain are perfect for locating natural mink paths, and make great spots to make a set. Since mink love to kill and eat muskrats, and even take over an old muskrat den as their own, any marsh that contains muskrats will probably contain mink. The North American mink can be found throughout most parts of North America (except for certain areas in the southwest) and throughout Canada. They have a long, streamline shaped body that allows them to enter the burrows of their prey and it also helps them as they swim, reducing water resistance. The mink animal is probably best known for its dense, soft fur and they've been bred in fur farms to make various coats and clothing items. They're also a mink oil source which is used in cosmetic and medical products. The oil is rendered from the fat on the pelts and its great for conditioning and protecting leather. Although they're not as easy to trap as muskrats or raccoons, mink are one of the most popular furbearers to target on a trapline. By following a few basic techniques and understanding where mink generally travel, you'll find trapping them is actually quite easy!